Most indications are that the next Euro Group head will be a relative newcomer to the group of eurozone finance ministers — Dutch minister Jeroen Dijsselbloem, who declared his formal candidacy for the job today. As I noted at the beginning of the year in my piece on 13 up-and-coming politicians to watch in 2013, the current head of the Euro Group since 2005, Jean-Claude Juncker, also prime minister of tiny Luxembourg since 1995 and the Luxembourgian finance minister from 1989 to 2009, is stepping down from the role. Dijsselbloem belongs to the anti-austerity social democratic Partij van de Arbeid (PvdA, Labour Party) — that has joined a coalition that’s headed by the decidedly more budget-obsessed Volkspartij voor Vrijheid en Democratie (VVD, the People’s Party for Freedom and Democracy) and prime minister Mark Rutte. The second Rutte cabinet took office as a ‘purple’ Lib-Lab coalition in November 2012 after a closely fought election in September 2012, during which Labour leader Diederik Samsom fought for a more gradual process of budget cuts to bring the Dutch budget within 3% of GDP. The Ministers of the Member States whose currency is the euro shall meet informally. Such meetings shall take place, when necessary, to discuss questions related to the specific responsibilities they share with regard to the single currency. The Commission shall take part in the meetings. The European Central Bank shall be invited to take part in such meetings, which shall be prepared by the representatives of the Ministers with responsibility for finance of the Member States whose currency is the euro and of the Commission. The Euro Group typically meets a day before the Economic and Financial Affairs Council of the Council (Ecofin) of the European Union — Ecofin is comprised of the wider group of all 26 EU member state finance/economics ministers. Accordingly, the Euro Group typically dominates economic policymaking at the Council level. At the Council, policies related to fiscal matters must be adopted unanimously, though other policies can be adopted by the EU’s qualified majority voting mechanism (i.e., essentially a supermajority formula that requires both a majority of the 27 member states and a majority of the EU population). The Euro Group president is appointed for a term of 2.5 years, by majority vote of the Euro Group, and the next president could be appointed as early as Monday, though French finance minister Pierre Moscovici has called for a more formal and transparent process of selecting the next president. Moscovici has also called on Dijsselbloem to outline his views on the future direction of the Euro Group, and Dijsselbloem is set to discuss goals at Monday’s meeting, though Juncker has been dropping all sorts of hints that Dijsselbloem’s selection is all but assured. Dijsselbloem has been a member of the Tweede Kamer (the lower house of the Dutch parliament) since 2000, after spending four years as an assistant at the ministry of agriculture, nature management and fisheries. In parliament, Dijsselbloem has been a moderating voice on highly charged issues like the role of Muslims in Dutch society. In 2007, he spearheaded a commission on educational reform. 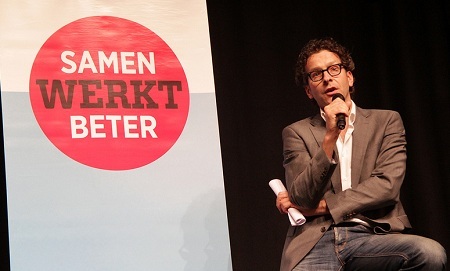 Earlier in 2012, when former Amsterdam mayor Job Cohen resigned as Labour leader, Dijsselbloem was chosen to serve as the party’s interim leader until Samsom was elected as the permanent Labour leader, and he was the fifth candidate on Labour’s list in the 2012 elections. As early as the 2003 election, Dijsselbloem was seen as a Samsom confidante — they campaigned together in that year as the ‘rode ingenieurs‘ — the ‘Red Engineers’ — due to their red overalls and scientific backgrounds, Samsom in nuclear energy and Dijsselbloem in agricultural economics. Despite just two months on the job as a pro-growth minister in a government that will seek to reduce the Dutch budget to within 3% of GDP in 2013, Dijsselbloem literally personifies the current fiscal debate in Europe. It helps that the Netherlands was one of the original six countries that formed the predecessor to the European Union and that it retains one of Europe’s last remaining ‘AAA’ credit ratings. On one side, as personified by Moscovici and French president François Hollande of the center-left Parti socialiste, only aggressive government policies to boost aggregate demand can reduce unemployment and jumpstart Europe’s economic engine. Although even Hollande admits the need to bring France’s budget in line with the European Union standard, generally, of within 3% of GDP, Hollande’s government has preferred to implement tax increases rather than cut spending too deeply. On the other side, as personified by German finance minister Wolfgang Schäuble and German chancellor Angela Merkel of the center-right Christlich Demokratische Union Deutschlands (CDU, Christian Democratic Union), the key to prosperity — even in the face of recession — is to cut spending and narrow the budget deficit, thereby bringing more investment and business confidence by shoring up public finances. Throughout countries like Ireland, Spain, Italy, Estonia and others, the eurozone sovereign debt crisis has forced many countries with no option but to pursue extreme austerity measures — tax increases and budget cuts — in addition to economic and labor reforms in order to keep bond rates from spiraling out of control. In some countries, like Greece and Portugal, already on the brink of bankruptcy, bailouts from the European Union and the International Monetary Fund have come with conditions of austerity measures as well. In other countries, in particular in the United Kingdom under prime minister David Cameron and chancellor of the exchequer George Osborne of the Conservative Party, there aren’t any international bond barbarians at the gate, necessarily, but governments have nonetheless proceeded to adopt harsh budget-cutting strategies. Supporters of this approach note that no one is certainly adding the United Kingdom to the list of debt risks in Europe, but opponents charge that the austerity has sapped consumer demand, leading to a double-dip recession and increased unemployment, which in turn is widening the fiscal gap to be bridged, thereby leading to the downgrading of the UK credit rating anyway. To some degree, the Merkel-Cameron side has already won — on January 1, 2013, the EU fiscal compact treaty went into effect for not only the eurozone, but the entire European Union (save the United Kingdom), which stipulates that each country maintain an annual budget deficit less than 3% of GDP, a structural deficit of less than 1% of GDP (unless public debt exceeds 60% of GDP, in which case the structural target is 0.5%). Werner Faymann, the social democratic chancellor of Austria.